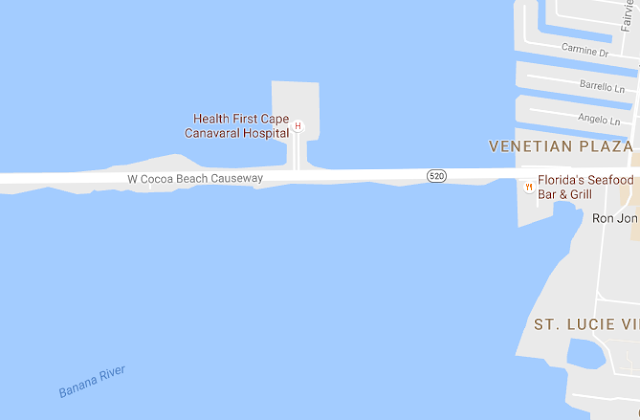 COCOA BEACH, Florida - At approximately 3:31 p.m. on Monday, August 1, 2016, a 45-year-old homeless man was attempting to cross State Road 520 (Cocoa Beach Causeway) in the area of Cape Canaveral Hospital on his bicycle and was struck by a vehicle driven by 91-year-old Verlin Jenson of Cocoa Beach, Florida. Police say that the bicyclist sustained serious injuries and was airlifted to Holmes Regional Medical Center in Melbourne where he was listed in critical condition. The driver was not injured in the crash. Eastbound lanes of State Road 520, a major thoroughfare into the City of Cocoa Beach, were closed for well over an hour due to the crash. Anyone with information pertinent to this investigation is urged to contact the Cocoa Beach Police Department at (321) 868-3251.